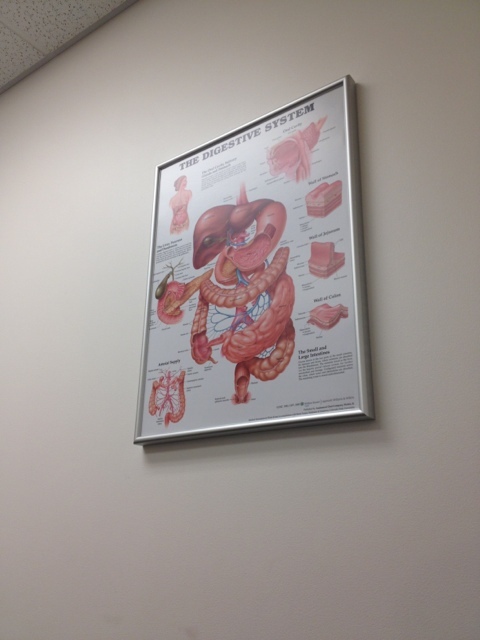 I went to the gastroenterologist yesterday and while that doesn’t seem like something I would enjoy, I fully did (well because I wasn’t having the dreaded colonoscopy). You see, my doctor is seriously one of the best I have been to in my life. No wonder he made Milwaukee magazine for being one of the top gastro docs in the area last year. If you haven’t found a doctor that you like yet, no matter what your health issues, switch! My new doctor is consistent with his visits. He wasn’t just pleasant and detailed with his explanations on the first visit. He actually seems to care and shows me that by answering my questions and spending time talking to me vs. rushing me out the door. For example, I asked him the long term effects of being on omeprazole. It is one med I am constantly reading negative things about. 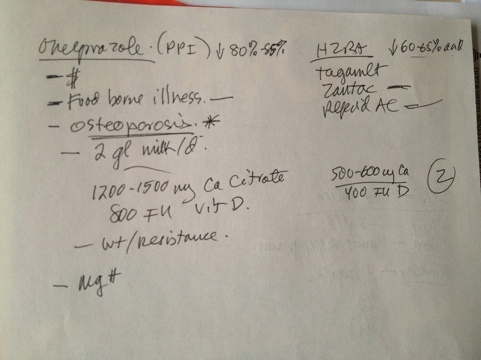 He laid out those negative side effects, including being more susceptible to food borne illnesses and talked about the studies he has read about osteoporosis and those who were on omeprazole. He suggested that I try to go to an acid blocker that is more mild and take notes on how I feel. So, I’ll be picking up some Zantac and Pepcid AC soon. I hate to compare, but my old doctor and the hospital they were affiliated with had the doc sitting at a desk typing away about my condition. 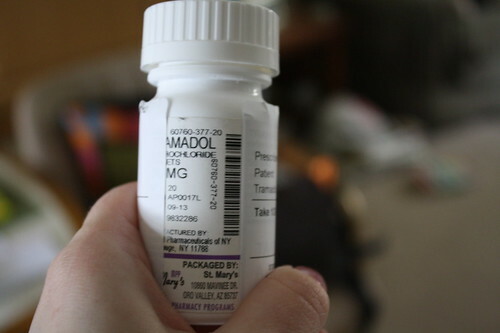 They rarely discussed much about changing my meds and didn’t really answer my questions the way I had hoped they would. -experiment with Miralax. In the past, I was told not to. Now, I have been doing that on my own and realizing I don’t need a full cap full of the dose every day. I can figure out what works best for me. -lower my dosage of Asacol. I used to be on 6 pills but because my disease wasn’t active last fall, I went down to 4 and now I can go down to 3. Doc says I may not have to be on a med like Asacol for the rest of my life! Once I got to work, I bought my lunch. I was hoping for the salad bar, but alas it wasn’t available. 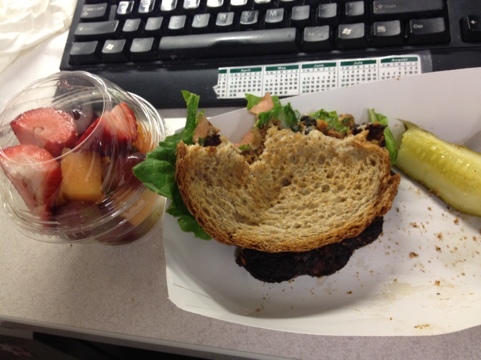 I had a black bean burger on whole wheat instead with a side of fruit. Gotta get that fiber in! 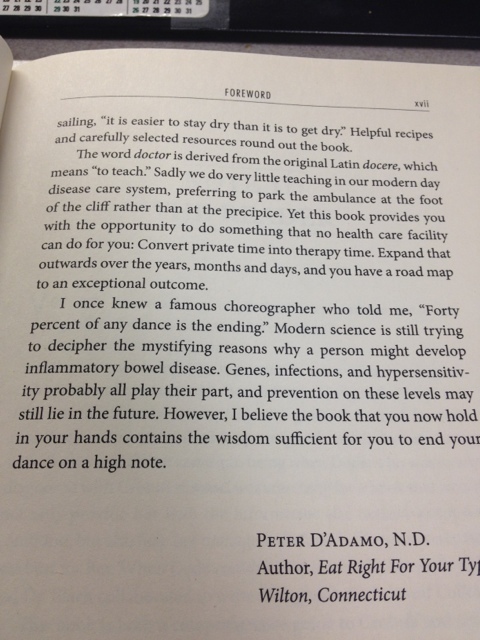 I started the book Living with Crohn’s and Colitis on my ride into work and found this passage, which made me think of my doc visit that morning. 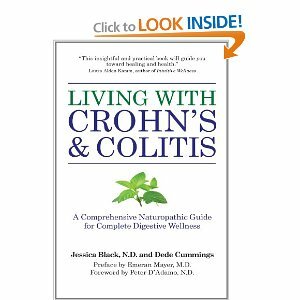 Hope this post was helpful for anyone with IBD or anyone who has a loved one with it! If you live in the Milwaukee area and are looking for a good gastroenterologist, e-mail me and I’ll get you my doctor’s information! I took a sick day today so I could get to the doctor for an x-ray. 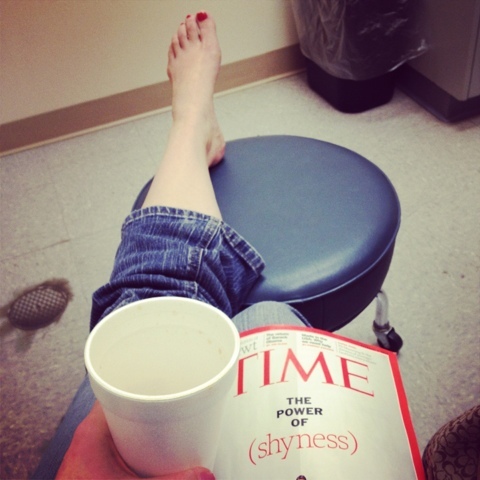 While waiting to get my ankle checked, I sipped on some coffee and read about introverts (which is a subject that has been fascinating me lately, more on that another day). Turns out my ankle is sprained, luckily. The doc could see my old fracture from 2007 on the x-ray, but didn’t believe that my injury from yesterday was related to that injury at all. He said the bones and ligaments would have healed by now. While waiting to get a brace, a little (well big in the eyes of a bug hater) visitor came under the door. It was a centipede! I HATE centipedes, even more than spiders. I haven’t even seen one in our house yet, thank god. I hopped up to higher ground and then the radiologist came in and I told her why I looked so terrified. The doctor had a good laugh at my fear, but he understood. I was fitted with a figure 8 brace. And given some pain pills before being sent on my way. 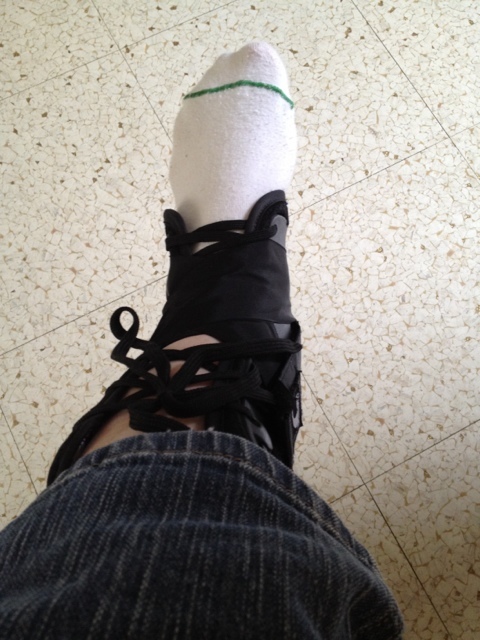 On Monday, I need to see the physical therapist, even though ankle therapy is something I know by heart by now. 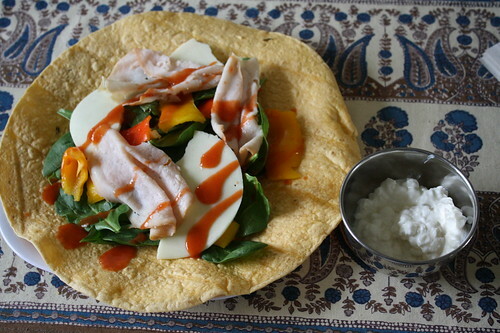 I was starving when I got home and made myself a turkey wrap with provolone, spinach, frank’s red hot sauce and sweet peppers. I had some cottage cheese on the side. I’ve been obsessed with cottage cheese lately. I have to buy the 4% milkfat to really love the flavor. Living in Switzerland spoiled me with wonderful cottage cheese and anything besides the 4% milkfat tastes fake to me. All wrapped up. 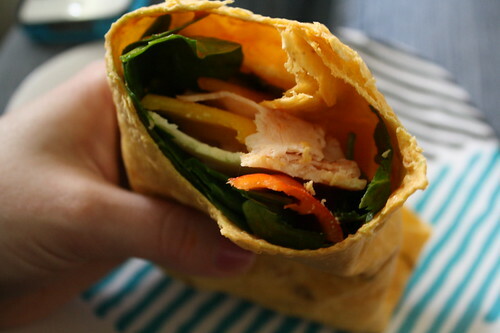 I love wraps and never get sick of them. 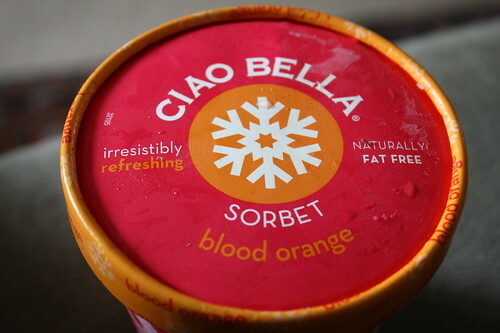 Dessert was blood orange Ciao Bella sorbet. I saw it on Healthy Tipping Point the other day and knew I had to try it. I am also obsessed with anything blood orange lately, thanks to Chobani! Karma wanted to try some too. I’m going to rest on the couch and maybe read for a bit. Catch you later! Have a great Friday. 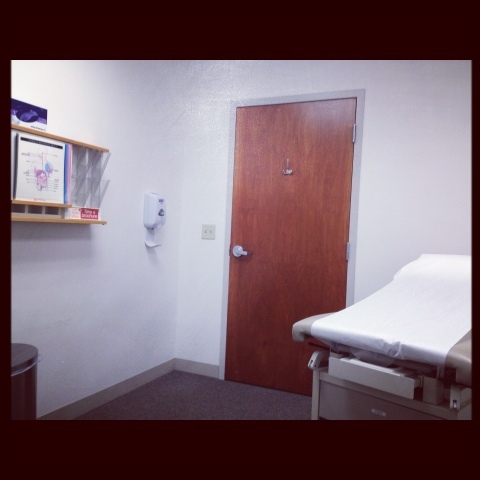 Between yesterday and today, I went to two different doctors for checkups. I am glad I got the appointments over with and I’m all checked up for now. I am going to see a new Gastroenterologist in September and I am looking forward to that appointment, because I heard the new doc I am seeing spends a lot of time with his patients. 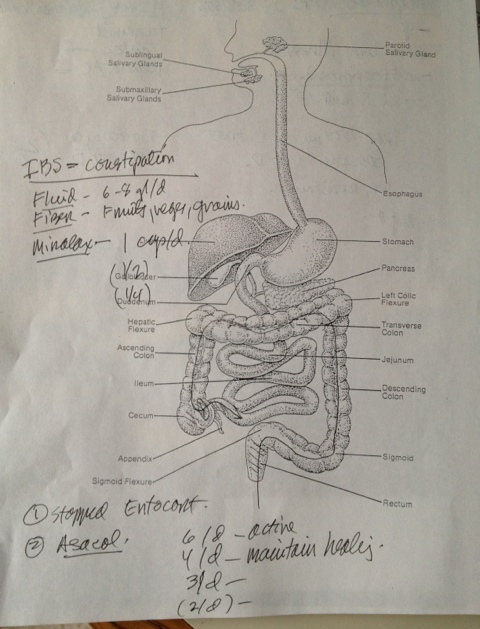 After being sick a lot with colitis, despite all of the medicine I am on, I want someone to look into my condition a bit further than my current doc has. I even went so far as to request my medical records from my old doctor so I can do my research and read through my history so I can be a better informed patient. Right now, I am taking a break from packing. I am headed to my parents’ house tonight to stay overnight. Tomorrow, my mom and I are going to Madison for the Farmer’s Market, then to New Glarus, and hopefully to the outlets at the end of the day. I am looking forward to a little day trip and to spending time with my mom! I tried a new cereal for breakfast. I went to Whole Foods after my doc appt. last night and picked up lots of goodies! I had a coupon for the Yogi brand of granola or cereal, so I tried this one. 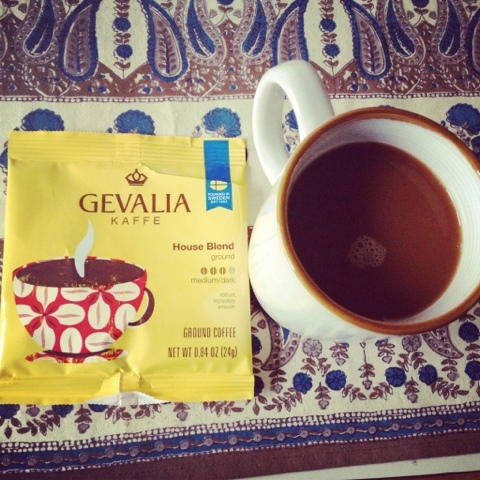 I loved the flavor–natural, yet delicious tasting! 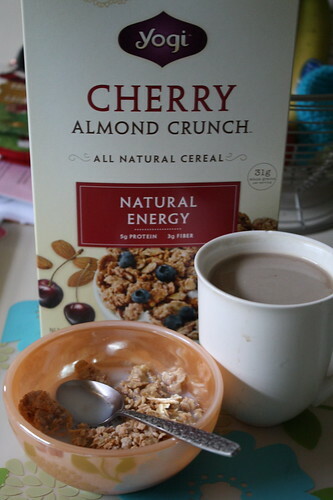 The cherry flavor was subtle, but blended together beautifully with the almond. At work, I treated myself to an iced coffee and I snacked on a banana. Lunch was the rest of the quinoa, chickpeas, and Mmmm sauce. 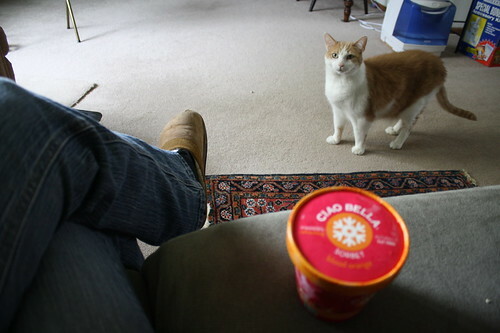 I also had a Strawberry Banana Chobani. I left work early for the doc. The doctor and I had a funny conversation about my last name. Turns out that she had been saying my name for the last two days. I can’t say why for privacy reasons, but the stories she told me had me cracking up. She always eases my nervousness and makes me laugh. We also had a nice discussion about greek yogurt. She lit up when I said I eat a lot of that and I don’t think I have to worry about my calcium intake because of the amount of dairy I eat. When my doc appt. was over, I headed to Target. I didn’t grab a basket on purpose. I found too many items, per usual, and I was almost dropping things on my way to the cash register. That was better than throwing things into a cart and spending over $50 like I normally do there. 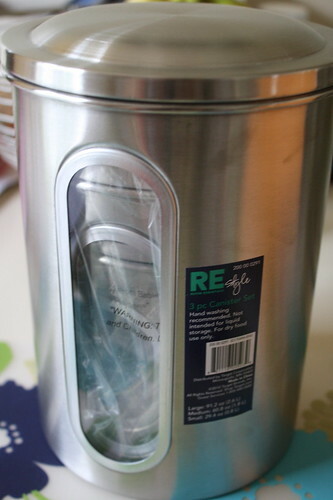 I finally purchased some stainless steel canisters for my flour, sugar, etc. I have been going back and forth for months about the OXO ones and this type. 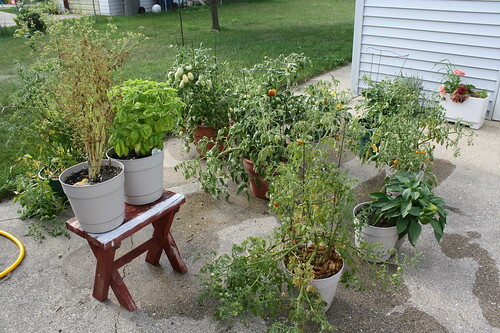 I like how these look and maybe someday when we have a bigger kitchen, they can sit on the counter too. 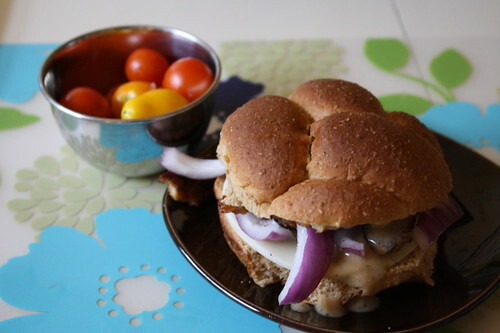 Dinner was a whole wheat bun with temeph, red onions, provolone cheese, goddess dressing, and some mayo. 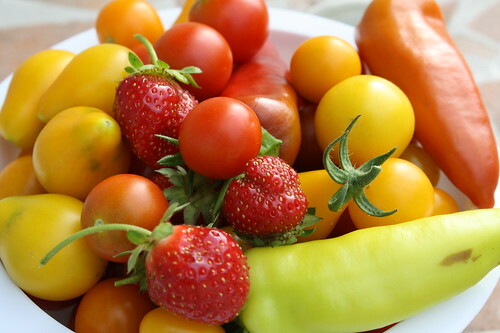 I also had some tomatoes on the side from our garden. 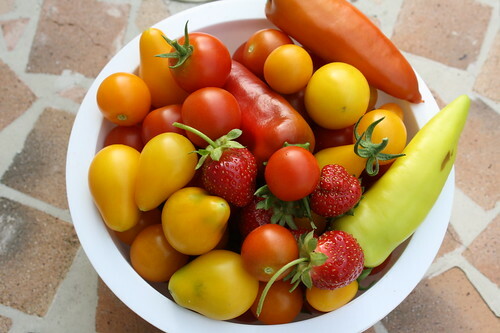 Here’s the big bowl of goodies we picked tonight. Time to get off of here, take a walk with Craig, and then hit the road for my parents’ house!